This is my mom’s easy recipe for potato salad, with diced vegetables and hard boiled eggs. 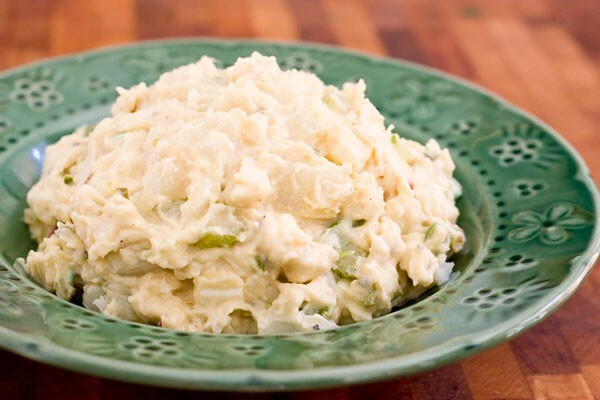 One of my blog friends, Kay, from Cooking with K, had asked me about my potato salad recipe. It took me a while to remember what all I put in it. Then I also remembered I hadn’t made it in quite a while. My potato salad has lots of diced vegetables for extra crunch and nutrition. I use crunchy onion, celery, and bell peppers. I also use pimentos and pickle relish. For extra flavor, I add some Dijon mustard. I used our Easter eggs we had colored for the potato salad, so there were little pieces of pink and blue egg mixed in the salad, very festive. I have been making lots of variations on this traditional potato salad, but had not made my mom’s recipe in a very long time. I decided what better time to make it than on Easter. Potato salad is a great complimet to ham or chicken. I had forgotten how much my husband loves this potato salad. I am going to have to make it more often. I served my traditional potato salad along with ham and blackberry bourbon sauce, roasted asparagus, and yeast rolls for Easter dinner. The day before Easter, we took our son to a neighborhood Easter egg hunt. It was put on by the city of Longwood, Florida and our local family radio station, Magic 107.7. They had lots of fun activities for the little kids, and the egg hunts were divided up by age groups. Unfortunately, we missed the 2 year old egg hunt by 2 minutes, so we had to put him with the three year olds. He did great, although the egg hunt was more like an egg run. All the kids start on a line and race for the eggs, placed in plain site on the lawn. Then they turn in their plastic eggs, no matter if they get 1 or 50, and get the same candy prize. Funny, I remember our church egg hunt were pretty challenging. We had to dig through pine straw, search under bushes, and scavenge through all the little hiding places we could think of like flower pots. He did have lots of fun though, got to meet the Easter bunny and the Geico Lizard. No we don’t have Geico insurance, but the lizard is cute. There were activities for little ones, like searching for treasure in a sandbox, matchbox car racing, and a train ride. There were also activities for older kids like a cake walk and crafts. After the fun activity, they gave the kids a candy prize. It was all very cute, but a much larger event than we had anticipated. It was very crowded, but so much fun. Place diced potatoes in water with a little kosher salt. Boil potatoes until tender, drain well. Add to a large mixing bowl. Boil eggs, peel, and dice. Add all other diced vegetables. Add mustard and mayonnaise and stir well. Refrigerate for 2 - 3 hours or until chilled. I love having a good amount of texture in potato salad. This looks delicious. The easter egg hunt with your son sounds adorable! I’ll bet he napped well after that! That must be a tasty potato salad with all those goodies in it. Mommies know best, right? .-= Anna´s last blog ..Kumquat Sangria and Fajitas =-. This looks awesome! And I love the fact that it’s your mom’s! Looks absolutely delicious and perfect for a picnic! .-= Angie’s Recipes´s last blog ..Flour Tortilla =-. .-= Nicole (Making Good Choices)´s last blog ..Crumb Cake You Will NOT Believe! =-. Too funny 🙂 I am making potato salad tomorrow for my little monkeys birthday picnic. Your mom’s recipe looks scrumptious. .-= Tickled Red´s last blog ..Y-E-L-L-O-W =-. I’m with your hubby, I love potato salad too. Your mom’s sounds great! I never used pimento, gonna have to try that one. Sounds like your Easter was lovely, I’m happy you had a great family holiday! I like the relish and pimentos in here. I always add both of those to my tuna salad, but have never added them to potato salad. This looks delicious and your photo is beautiful! I really like potato salad, especially the ones made at home. I actually like salads in general but potato is the best. Potato can be anything and it would be good, fried, mashed, etc. I LOVE a good Southern potato salad, and this is an awesome one – the addition of crunchy veggies is great. And by the way – your new site design looks fantastic! .-= Tasty Trix´s last blog ..Very Veggie, Very Healthy, Very Spicy Hungarian Goulash =-. There must be as many versions of potato salad as there are stars in the sky. Yours looks just delicious and very similar to my own mom’s which was a summer barbeque favorite. All of the sudden, I’m hungry for grilled chicken! You have a beautiful site. A yummy potato salad! I like the addition of pimentos! I looooooove potato salad this looks excellent! I love Easter egg hunts. We didn’t have an Easter egg hunt with the neighbors this year. There weren’t enough time to organize one so I came up with something else for my kids. I made chocolate eggs for them then hid them all over the house for them to find. They had a lovely time. .-= Drick´s last blog ..Steamed Ginger Fish =-. .-= Elin´s last blog ..Silky Tofu With Wakame ,Scallop & Minced Topping =-. We lived in Alabama and one of the older women in our Church always added cubed cheddar cheese to her potaoto salad. I have on various occasions done that and the children always seem to like it…with summer upon us thought some of your readers may like to try something new. What a great variation! I’ll have to try that one next time. Wash and cut your potatoes,(lets say 4) .boil them in water with salt until done but not too soft. In another pan, boil 3 eggs. In a separate bowl mix some mayo (about a cup), mustard (1-2 tablespoons) and about a TBS sugar and a couple TBS of dill pickle juice, salt and pepper. when the potatoes are done, drain them, add mayo mixture, chopped eggs, some chopped celery and onion and a little relish and a little chopped dill pickles. I like what you guys tend to be up too. This sort of clever work and exposure! Keep up the fantastic works guys I’ve included you guys to my personal blogroll.